My best friend, Sandy was always complaining me that we had not gone together for a holiday for so long. All set to prove her wrong, I told her to come up with some cool place that we could cover in three-four days. And lo! She came up with Jaisalmer. 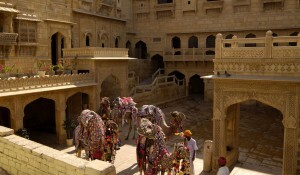 On hearing Jaisalmer Tour, my first reaction was dry land, sand, hot climate, NO!!! She was adamant that I will love it. Not quite excited about it, I still said Ok….let’s see your wonderland Jaisalmer. We took train from New Delhi Railway station to reach Jaisalmer. All throughout the journey, Sandy annoyed me with her list of ‘Things to Do’ in Jaisalmer. She told me about the major attractions of Jaisalmer to increase my curiosity level. On reaching Jaisalmer, we loosened up our self in a nice hotel. After getting some rest, we set out for Jaisalmer tourism. I was awe-struck by the uncountable havelis in Jaisalmer, which are constructed with yellow sandstone. Thanks to the presence of these havelis, the city looks radiant, glittering in the night. Jaisalmer is very aptly called the Golden City. The city was founded by Rawal Jaisal, a Rajput king in 1156 A.D. Jaisalmer looks like a city of virgins – pure, clean, untouched, secured within its ramparts, and unaffected by external influences. We paid visit to Nathmal Ji ki haveli. It is one of the best havelis in Jaisalmer in terms of architectures and magnificence. The life-size models of guardsmen in the main entrance gave us a feeling of welcome and secured. Two elephant’s structures made of yellow stones, pictures of horses, cars, fans, cattle’s engraved on the walls are worth mentioning. 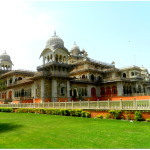 Our next destination was Patwon Ji ki Haveli. Standing tall in a narrow lane, this haveli is the largest Haveli in Jaisalmer. It is also the first haveli in Jaisalmer. The amazing thing about Patwon Ji ki Haveli is that it is a cluster of small havelis. Sandy equipped herself with a booklet of Tourism Guide of Jaisalmer, and then we set out for the Jaisalmer Fort on Trikuta Hill. Made beautifully out of sand stones, Jaisalmer Fort, better known as Sonar Kila, appears as a magical construction amidst the vast spread of Thar Desert. 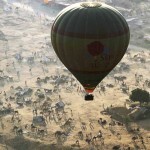 Jaisalmer Desert Festival, which is all about celebration of life, was next on Sandy’s list. 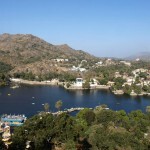 This festival is held annually in the month of February-March. I considered myself very lucky to be able to witness such a wonderful cultural extravaganza. Kite surfing, camel races, moustache competition, folk dance performances, puppet shows kept us hooked on. But I liked turban tying competition more than anything else. It was amazing to see the competitors tying their turbans at a lightning speed. The next day we had decided to go for camel safaris. In Jaisalmer and I don’t go for camel safaris! How could that be possible? So, I seized this golden opportunity and we both set out for camel safaris in Jaisalmer. The bumpy ride on camel took us through the vast stretch of Sam sand dunes. The camel ride lasted for a few hours. Although our backs were badly aching, we remained glued on the camel as the gorgeous sweeping sand dunes were too captivating. We had a real taste of desert life with Desert camping. Our tour organizer had arranged everything for us. We enjoyed lip smacking Rajasthani cuisine at the camp. A warm bonfire just in front of our tent created a comfortable ambiance. The musical performance by the folk artist added more fun to the delightful evening. I was so captivated by Jaisalmer that I didn’t realise when our tour come to an end. And so capturing all the beautiful memories in our mind, we came back to Delhi. I could not thank my friend enough for this wonderful trip. My visit in Jaisalmer was definitely an escape from the humdrum of the outside world to a more soothing environment.